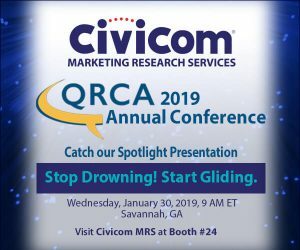 Civicom Marketing Research Services, leading innovator and provider of marketing research services, is a sponsor and speaker at the annual Qualitative Research Consultants Association (QRCA) conference. From January 30th to February 1st in Savannah, Georgia, Civicom will be showcasing its qualitative content management and curation solution Glide Central™ along with the Company’s suite of telephone and web-enabled marketing research solutions. Themed “Charting Your Best Course,” this year’s QRCA annual conference will focus on arming attendees with tools to help them steer towards the best course in qualitative research. The QRCA annual conference tackles real-world methodologies, technologies, and insights from the best in the market research industry. Over the course of the conference, qual professionals can partake in more than 20 workshops to discover and explore new and innovative qualitative methods. Civicom is an annual partner and multi-year platinum sponsor of QRCA annual conferences. This year, Civicom shines the spotlight on Glide Central™ in an exclusive presentation to conference attendees: Glide is an online qualitative media management platform designed to solve the organizational pain points of managing the overwhelming amount of audio and video generated during qualitative research studies, thus enabling market researchers to increase the delivery of insights to their clients. Glide eliminates much of the manual, tedious video curation process by efficiently streamlining every step within one platform. Researchers can view recordings, create tags, produce transcripts, make clips, and harvest key insights and accelerate their analysis and improve the turn-around time of delivering impactful reports. Glide Central was developed by Civicom Marketing Research Services with the overburdened research professional in mind. Special discounts are offered to QRCA members. Attendees can catch Civicom’s Partner Spotlight Presentation entitled “Stop Drowning! Start Gliding” on the first day of the conference, January 30th, at 9 AM ET. Attendees can also drop by Booth #24 to learn more about Civicom’s wide range of telephone and web-enabled marketing research services. As a leading solutions provider for market research professionals all over the globe, Civicom believes in empowering every market researcher through creating practical innovative technology solutions, such as its telephone and web-enabled market research services, and continuously improving these solutions by joining insights professionals in acquiring new perspectives from events such as the QRCA annual conferences.